In most cases, we have mentioned that our displays may be double sided, may be taller and could be fitted with baseplates rather than the folding bases typically used. 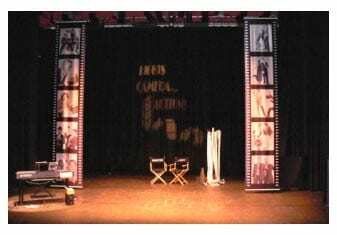 Backdrops and banners may also be wall mounted or held by suspension wires. In this page, we briefly explain a little further about each of these as more detailed information is available elsewhere in the site about each of these possibilities. We make several different bases to work with different widths of display. For each folding base, there is also a baseplate alternative. These are solid aluminium squares or rectangles which may be fitted with pole attachments via simple screw assembly. Each is supplied with screws, pole attachments and an Allen key.The image above shows a banner stand fitted with a baseplate rather than a folding base. See system in detail / base types. The baseplates are sometimes used when a display is to semi-permanent rather than portable. Baseplates are more costly than the folding bases and require a separate carry case if portability is required. They are much flatter, height about 0.5cm versus the folding bases where height is approx 6cm. When used up against a wall, the baseplates offer the advantage of having less depth than a folding base and so can get closer to a wall. Normally, our displays are fitted with fixed height poles. These are sectional and built up in a push fit manner but we can also create special fixed height poles tailored to your individual requirements but subject to minimum order quantities. However, in circumstances where a little extra height is needed or when the height you need to display the graphic varies, you can use our telescopic poles instead of the fixed height poles. 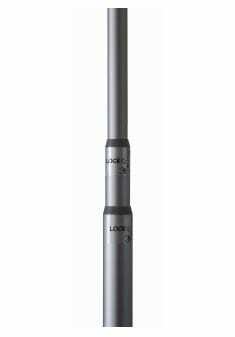 The 2 piece telescopic pole is adjustable from 135cm through to 250cm. 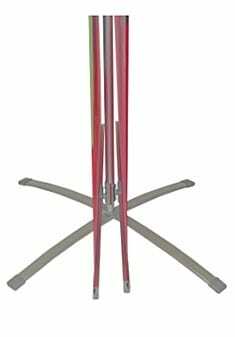 The 3 piece telescopic pole is adjustable from 135cm through to 374cm. Our telescopic poles are nicely engineered and feature a simple twist / lock action – so just unlock, set the height and then twist to lock in position. In most cases, a single sided display is all that is required but if required, all of our banner stands and backdrops can be made double sided. To do this, we use different clips to attach the graphics at the top and bottom of the display such that they accept a graphic panel on both sides rather than just the front face. The first image on the right shows 2 graphics either side of the vertical pole on a Crossbase display stand. See features and flexibility / double sided for further details. 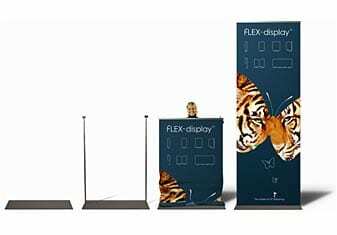 Where space limitations or cost mitigate against using a free standing backdrop display the FLEX system enables the backdrop to be displayed without the need for supporting hardware. If the backdrop is to be displayed in a shell scheme at an exhibition, then using our hanging clips (which snap on to the rail attached to the top of the fabric graphic) and our “S” hooks, the backdrop can be hung from the wall of the shell scheme. If the backdrop is to be displayed other than against a shell scheme wall then once again our hanging clips will provide a suspension point to which hanging wires can be attached. 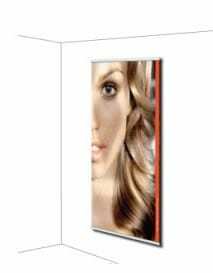 Where the backdrop is intended to be a permanent or semi permanent display – perhaps behind a reception desk or on the wall of a conference room then our wall mounting kit can be used to display to display the fabric backdrop with a minimum of fuss or preparation. With our system, you can use the fabric backdrop (with rails top and bottom) and have the option to suspend this, either with hooks over a shell scheme wall or by using suspension wires. This is because we can supply eyeleted clips which fit to the rear of the rails to allow this. 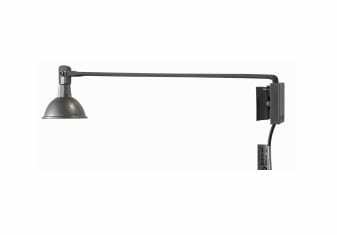 Additionally, we also have a wall mounting system whereby a different clip set is supplied with wall mounting fittings. See hanging & mounting for further details. There are spotlights available for all of our systems.